Congress granted gunmakers unprecendented protections in 2005, so Remington may be right. Bridgeport, Connecticut—Standing not more than three feet from families of several Sandy Hook victims in a Connecticut courtroom on Monday, a lawyer for Remington Arms Company asserted the gun manufacturer cannot be held accountable for anything that happened inside the elementary school in Newtown three years ago. If he’s right—and he may be—Monday’s hearing on a defense motion to dismiss was the first and last time Remington will be in Connecticut Superior Court for a meaningful hearing about the Bushmaster XM15-E2S assault rifle that Adam Lanza used to fire 154 bullets in 264 seconds, killing 20 children and six school administrators. Amid all the strong legal disagreements about complex areas of liability law, there was one thing everybody agreed upon: Congress gave gun makers a remarkable level of protection when it passed the Protection of Lawful Commerce in Arms Act, or PLCAA. “This is unique in the sense that it’s the only industry that has any kind of immunity, and that really is just an extension of the gun lobby’s pull on Congress,” Joshua Koskoff, who is representing the Sandy Hook families, told reporters before the hearing. The legal team representing the families is trying to punch through PLCAA and get to trial using two of the six exemptions written into the law. One exemption permits lawsuits if a manufacturer or seller knowingly violated a state law “applicable to the sale or marketing of the product,” and one allows suits against gun sellers for negligent entrustment of firearms. The plaintiffs allege that Remington—and Riverside Gun Sales, which sold Nancy Lanza the Bushmaster XM15-E2S, and Camfour, a Massachusetts distributor which served as an intermediary between the gun shop and Bushmaster—violated the Connecticut Unfair Trade Practices Act by deliberately marketing and advertising a gun with enormous killing potential, and highlighting that killing potential in advertisements. “Forces of opposition, bow down. You are single-handedly outnumbered,” read one Bushmaster catalogue. Remington and the other defendants claim the ruling by the US Court of Appeals for the Second Circuit in City of New York v. Beretta narrows that exemption as applicable only to laws that “expressly regulate firearms” or “that clearly can be said to implicate the purchase and sale of firearms.” Their argument is that allowing a claim under a broad Connecticut tort law would swallow the entire gunmaker immunity designed by Congress. The families also claim that the very act of marketing and selling AR-15s to the public represents a “negligent entrustment” under the law. Typically, negligent-entrustment cases have targeted gun retailers—the exemption in PLCAA is for “sellers”—and involve misconduct in the transfer of guns. One successful case that got through PLCAA last year involved two injured police officers who sued Badger Guns, a retail shop in Wisconsin. The store had became a hub for straw purchasers of firearms and a clerk helped a straw buyer fill out a purchase form while the man who would eventually use the gun to shoot the officers stood nearby. The officers won a $6 million judgment in that case. Vogts, the Remington lawyer—who also represented Badger Guns—argued that Remington isn’t a seller, and also that there was no negligence in the legal distribution of the gun that lead to Nancy Lanza’s lawful purchase of the weapon. The plaintiffs point to Remington’s federal dealer license as evidence the company is a seller under the law. But they’re also taking a novel approach regarding what “negligent entrustment” means. Their case is that the fundamental act of marketing and selling military-style weapons like the Bushmaster XM15-E2S is negligent and unreasonable, due to ample evidence the guns are used in extreme acts of violence. If this claim is ultimately successful, it could radically transform the American gun marketplace. It would potentially expose any company that sells assault weapons to civil lawsuits. But there’s a long road to a jury verdict, and the case can be fairly called a long shot. A more immediate victory would be a ruling from Judge Barbara Bellis that PLCAA doesn’t apply—the case would move immediately to the discovery phase, and Bushmaster would likely have to disclose a lot of information about its marketing practices and internal evaluations of XM15-E2S’s lethality. Bellis will issue her ruling by April 19. At times she seemed skeptical that the case should be immediately dismissed, and asked defense attorneys how she could evaluate whether Remington was a seller without undergoing a discovery phase. The families are hoping that, at the very least, the proceedings will expose some of the gun industry’s practices to the public. 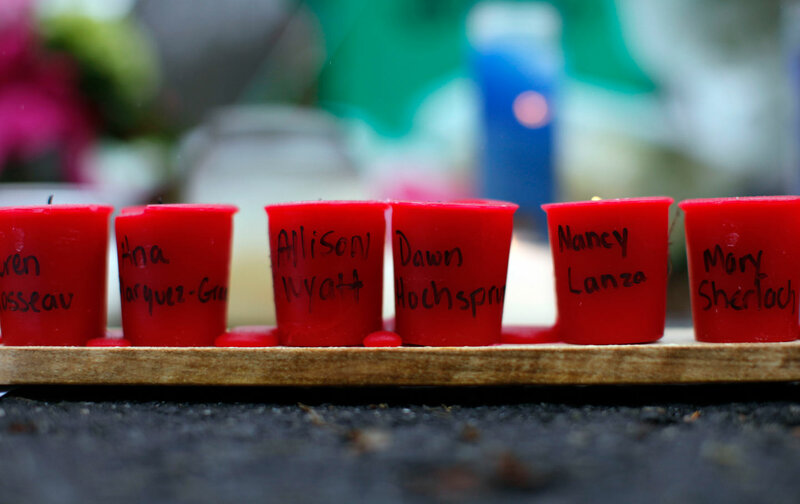 “The manufacturer is marketing to people like Adam Lanza, and they know it, and now we know it. And it’s time that everybody knows it,” said Mark Barden before the hearing. His 7-year-old son Daniel was killed at Sandy Hook. Outside the small courtroom on the sixth floor of the Fairfield Superior Court in Bridgeport, the case was making wider political waves, as gunmaker immunity has become a big issue in the Democratic presidential primary. Right before the hearing began, Hillary Clinton’s campaign held a press call in which Connecticut Governor Dannel Malloy blasted Senator Bernie Sanders for supporting PLCAA in 2005. Clinton voted against it. The Sanders campaign did not return a request for comment. Joyce Chu provided additional reporting.